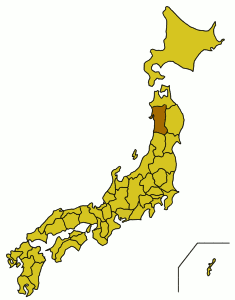 Akita Prefecture (秋田県 Akita-ken) is in the northeastern Tohoku region of the main Japanese island Honshu. Yuzawadai - a semi-rural community famous for the Roman Catholic apparitions known as Our Lady of Akita, which allegedly happened in the Seitai Hoshikai convent. The convent itself is one taxi or bus ride away from the city of Akita and has rather interesting buildings and crafts, plus beautiful gardens. Akita is the original home of the Akita dog (Akita inu), the famously loyal dog of Hachiko fame. In 2010, the prefecture's population was just over 1 million people. The Akita Shinkansen provides hourly service from Tokyo station to Akita station. Trains are all-reserved and are known as Komachi (こまち) trains. The trains only stop at Ueno, Omiya, Sendai and Morioka before slowing down to travel to Shizukuishi, Tazawako, Kakunodate, Omagari, and finally Akita over conventional rail lines. Trains also reverse direction once at Omagari, the stop before Akita. Komachi trains from Tokyo reach Akita in four hours and cost ¥16,800 each way. Beware that the Komachi trains are coupled to Aomori-bound Hayate trains, which split at Morioka, but as all seats are reserved the chance of getting in the wrong car is minimal at best. For foreign tourists traveling from Tokyo, the better deal is to purchase a JR East Rail Pass or the national Japan Rail Pass. The Akebono overnight sleeper train from Tokyo's Ueno station, and the Nihonkai from Osaka and Kyoto, stop in Akita before terminating in Aomori. The "Nihonkai" service was terminated March 17th 2012, barring special services around August for Aomori's Nebuta Festival. JR Tohoku Bus operate a long distance bus Dream Akita/Yokohama Express from Tokyo and Yokohama. It leaves daily from Tokyo station southern Yaesu exit at 9:50PM (8:55PM from Yokohama station east bus terminal), and arrive Akita station at 6:35AM the following day. ¥9,100 single (¥9,500 from Yokohama). Odakyu Bus also run an overnight bus service, the Flora, from Shinjuku to Akita. Two departures each night (8-9 hours, ¥9,450 one-way). Shuhoku  runs a bus from the Tobu side of Ikebukuro at 10PM each evening arriving in Kazuno (6:20AM), Odate (7:05AM), Takanosu (7:35AM) and Noshiro (8:35AM). Few people speak English in Akita. If you don't speak Japanese well, factor this into consideration when planning. 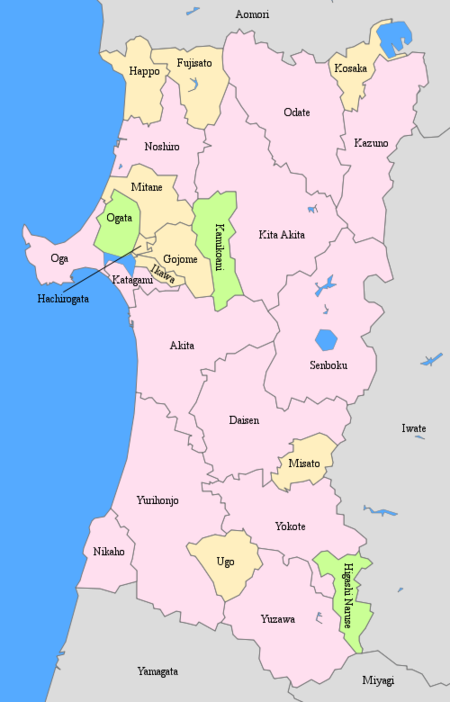 The dialect of Japanese spoken in Akita is called Akita-ben. In rural areas, Akita-ben can be very heavily used, and consequently incomprehensible even to native Japanese speakers. On the other hand, in most of Akita, the dialect is not so strong. Akita's weather and clean water are said to be ideal for growing rice, and the local komachi variety is sought after throughout the country. Perhaps the most well-known Akita dish is kiritanpo. Kiritanpo is essentially a tube made of rice, generally formed around a disposable chopstick. It is often roasted, sometimes after being smothered in miso paste. It is also eaten in kiritanpo nabe, a stew of sliced kiritanpo, vegetables, and chicken or fish, most commonly eaten during the winter. Though consumed throughout Japan, Akita's Oga Peninsula is known for inago, a sweet teriyaki-like dish made of grasshoppers cooked in sake, soy sauce, and sugar. In late winter, hata hata, or sailfin sunfish is popular, usually cooked in a stew. It has a strong flavor, and females with intact egg pouches are most prized. Akita's famed komachi rice is used to brew many different varieties of sake, some of which are popular throughout Japan. Many of Akita's towns have a local sake brewery, some of which offer tours. On the outskirts of Kakunodate is the Tazawako Brewery. This microbrewery brews a handful of craft beers, and contains a restaurant with all the brewery's beers on tap. This page was last edited on 23 March 2018, at 14:55.